Let me start off this post by saying that anyone who tells you parenting is easy is lying. 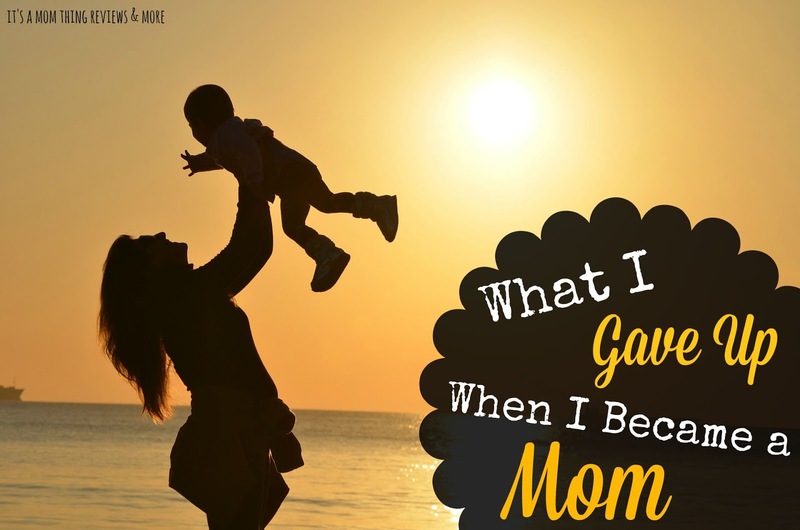 When I had my daughter I had absolutely no idea how to parent a child, how to handle crying babies, how to potty train a toddler, or how to get a spirited child to relax for five minutes. Becoming a mom teaches you a lot about children, a lot about parenting, but most of all a lot about yourself. When you become a mom you give up a lot of things and things that seem like simple tasks are now challenges. Below are the things that I gave up when I became a mom. 1. Eating full meals without your food being stolen - Moms, you know exactly what I am talking about. I cannot count on my hands how many times I have walked into a room with food and my daughter has stolen it from me. It doesn't matter if she just ate or if she has her own plate of food, she wants mine, and she typically devours it! The only time I get to eat a meal in peace is if she doesn't like what I have. But of course she still comes over and peeks at the plate. 2. Taking a long shower - Ahhh, the days of being able to wash my hair and not worry about shampoo residue still left in it when I step out of the shower. Since becoming a mom pretty much everything that I do has a time limit, showers are one of them. When Mia was a baby I took a shower while she was sleeping for short periods of time or whenever I could get someone else to keep an eye on her for a few minutes, it's gotten easier as she has gotten older, but I still make sure to keep them short since who knows what a six year old could do. 3. Getting a sick day - Remember when you were younger and were in school, sick equaled sick day. Even working out of the home before kids, when you got sick you could often call out. When you are a mom there is no such thing as a sick day, when your kids need something you are there, regardless of how sick you feel. 4. Doing things (like using the bathroom) without an audience - Oh how I miss being able to go to the bathroom without a child following me or standing outside of the door talking to me. I think, "Can I please just pee?" has become a regular sentence in my vocabulary. Actually, most things that I do requires an audience: cooking dinner, changing my clothes, reading the newspaper, pretty much everything. 5. Getting a full night of sleep - "Sleep when the baby is sleeping" is what they say... yeah, pretty much never happened. In theory it is a great idea, in practice moms just have other stuff that they need to do. Even now, my daughter has a bedtime that we follow pretty regularly but I still don't head to bed until late. After Mia is in bed I straighten up the house, do dishes, take a shower, spend time with my husband, take some time for me, and do anything else I didn't do throughout the day. Therefore by the time I fall asleep it is time to be up in a few hours with a little one ready to start her day. 6. Finishing sentences without being interrupted - I am sure that every parent has been there, in the middle of a sentence when your child says "look at this" or starts a full on conversation about something completely unrelated to what you are saying. Drives me crazy. Finishing a sentence should not take twenty minutes. I have given up quite a few things, but nothing that I have given up has come close to what I have gained from being a mom. Yes, my daughter steals most of my food, but I gained family dinners, one of the times that we get to focus on each other and nothing else. I may have had to give up long showers and doing things without an audience but I gained having a little girl who loves spending time with me so much that she wants to follow me around the house and watch my every move. I have lost sleep, lots and lots of it, but I have gained long day after long day with my daughter, which I wouldn't trade for anything. I may have to repeat myself a lot and I may not be able to finish sentences but now I have a child who wants to tell me something so much that she just can't wait even a second to get it out. One day children will grow up and they will have their own lives. That is when I will have plenty of time to sleep, eat full meals, take long showers, do things without an audience, and relax on days that I am sick. I will have time to do lots of things without little eyes watching me and little feet following behind me. And all of those years from now I will be wishing for someone to interrupt my sentences. So like I said, nothing that I gave up when I become a mom comes close to what I have gained, I have gained so much love. All of this, especially the shower part. I barely know how to take a long shower anymore. I'm constantly thinking I hear the phone ring or my son is calling my name.